SPRINGFIELD, Mass. 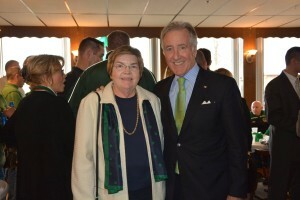 – United States Congressman Richard Neal officially announced his support of Mary E. Hurley, candidate for Governor’s Council. Neal cited Hurley’s experience and discussed her qualifications for the Governor’s Council position. “I have known Mary Hurley since we both worked as substitute teachers in the Springfield Public Schools. When I was an aide to Mayor William Sullivan, she worked in the Springfield Law Department and was the lawyer for the city council. We continued to work together on the city council and when I was elected as Mayor, I often relied on her for her valuable insight and leadership. Mary followed me as Mayor of the City of Springfield, where she did an excellent job in difficult financial times. She was also mindful of the environment, initiating recycling in the City of Springfield.